Introducing new Peaceful shower gel and new liquid hand wash range Palmolive has extended its enchanting Ayurituel range of shower gels by introducing Peaceful, with Indian Neem and Jasmine to soothe your senses, along with two new indulgent hand-washes. Ayurituel is inspired by the wisdom of Ayurveda which believes in the principles that everything on this planet, including our bodies, consists of five master elements: Space, Air, Fire, Water, and Earth. Our biological systems combine these five forces into three primary patterns known as ‘doshas’of which we all have although one or two of these may be more predominant. 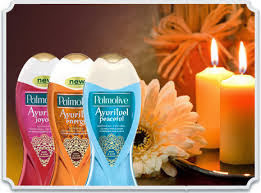 Inspired by Ayurveda, Palmolive Ayurituel comes in different experiences, Energy which contains sandalwood and ginger for an uplifting effect, Joyous which contains lotus flower and Indian mulberry and Peaceful with Indian neem and jasmine to calm senses. "The Indian practice of Ayurveda has been passed through the generations for more than 5,000 years and is followed by celebrities such as Madonna, Gwyneth Paltrow, Julia Roberts, Jennifer Aniston and Oprah Winfrey to name but a few. It takes a holistic approach by directing us to a healthier and more balanced lifestyle through the combination of mind, body, senses and the soul. Ayurveda encourages us to take responsibility for our own health according to the different stages of our lives, the seasons, and the environment we live, work and play in. According to Ayurveda, the five elements of nature - space, air, fire, water and earth - combine in the body as three components, or doshas, known as Vata, Pitta, and Kapha. These three mind-body types express particular patterns of energy and unique blends of physical, emotional, and mental characteristics. Each of us will have a dominant dosha or mind-body type which has a specific set of lifestyle and nutritional guidelines to help us achieve and maintain a good state of health. I have been trying out the Ayurituel Energy shower gel in particular the peaceful and energy and have really enjoyed using it. I love the ginger and sandalwood scent it is such a lovely smell and the gel leaves my skin not only smelling gorgeous but feeling gorgeous too. I love the bottles i like the designs and the colours which really make the product stand and gives it a bit more of a luxurious product look about it but at a reasonable price, I’m looking forward to trying out the Joyous and hand washing gels next. The new Ayurituel rang is available from most local super markets with an RRSP of £2.99 each.